There are thousands of variations of kimchi recipes, some quick and simple, some complex and fermented for days or weeks. This leans toward the simple side and it can be eaten in a day or so, although it gets better the longer it marinates. Kimchi can be eaten as a side dish, used in stir fry or egg rolls, or as a sandwich topping. Makes 8 cups. Place shredded cabbage in a large colander and salt generously, tossing with your hands. Let cabbage drain for 30 minutes. Rinse with fresh water and drain well. In a large bowl combine garlic, chiles or chile paste, sugar, lemon juice, vinegar, soy sauce and fish sauce (if using) and whisk together. Taste and adjust as desired. 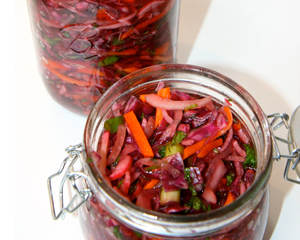 Add cabbage and the rest of the vegetables to the pickling liquid and toss with your hands, mixing well. Put kimchi in plastic storage bags and squeeze out the air — this will help distribute the pickling liquid evenly. Lay bags flat in the refrigerator, giving them a flip every once in a while. Wait at least 2 hours before eating, but it will keep for up to two weeks, getting better with time.